“Able to be believed; convincing.” That’s how Google defines the term credibility. It’s also, “of sufficient capability to be militarily effective” according to the Merriam Webster Dictionary. Here is an example, a credible excuse is one your parents might actually believe. Well, it turns out that it’s not just our parents who think highly of credibility, but generally, all educated readers want information from a credible and trusted source. Therefore your primary task as a blogger is to convince readers that you are that source. That your opinion, ideas and services are superior to those of your competitors. And then readers will want to listen to what you have to say. But what makes a credible article? And how can you boost the credibility of your content? Here are 4 tips that will help you stand out not only as a credible source, but also as a thought leader in your niche. 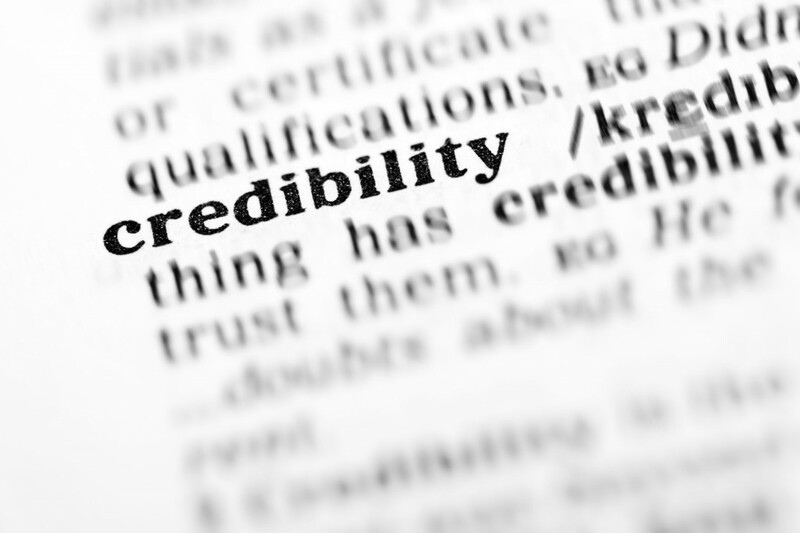 I believe that online credibility starts with a professional and visually appealing website. Sure, you can write articles on LinkedIn or free blog sites, but such platforms are limiting in terms of design customization. Most of them are also less attractive and contain long URL’sthat often lead to a destination other than your site. Remember that people make snap judgements and form a first impression about your site in less than 50 milli seconds. In fact, research by Google revealed that some readers take less 17 ms to decide whether they like your site or not. Other studies have also shown that, “70 Per Cent of People Don’t Trust Badly Designed Websites”. So, ensure that you are getting the most out of your site by providing an exceptional user experience that attracts and retains attention. Most bloggers know the benefits of having a well-crafted author bio, but that still doesn’t mean every author writes about themselves and their personal anecdotes. As it turns out, the author bio paragraph (usually at the bottom or top of the page) is particularly important in boosting your online reputation. In fact, when you let your readers in on your skills and experience in the industry, your post immediately becomes more convincing. You may also consider highlighting your educational background, along with other professional merits. Of course, your bio is bound to improve drastically as you build more relationships, but even one post published on an authority site counts and should be underlined. 3. Link to credible websites to gain trust. But, I am an SEO specialist with over five years of experience! Well true, but remember most of your readers do not know you. Let alone your expertise. To make a truly authoritative impression with your writing, you need to cite other experts including bloggers from popular websites in your field. You should also include relevant outbound links to improve user experience. And remember outbound links are excellent for SEO too ! Most of the time you have to make an argument or try to prove a hypothesis in your blog post. This is best done through research on the topic and then collect evidence to support your argument. Just ask Neil Patel! Apparently, Neil – whom Forbes has named among the top 10 online marketers – used this technique to grow his audience to over 100,000 monthly readers within two years. Obviously, you need be a very credible source to get this kind of readership, so this one I would say is a super-tip!